Condos are more and more in demand. According to the Boston Globe, condo prices this year increased 13 percent through the first five months of the year, compared with a 6 percent increase for single-family homes, according to the Warren Group, a Boston firm that tracks real estate. Statewide, sales of single-family homes declined almost 4 percent, compared with the same period in 2013, while condo sales rose 9 percent. In downtown Boston, the condo market has been even hotter — too hot for middle-class incomes. The average price per square foot of $728 set a record in the second quarter, the Boston data firm LINK reported, 12 percent higher than the same period last year. And the average square-foot price for luxury units, which include concierge services and other amenities, rose nearly 15 percent, to $1,188 - Read More... No longer Second Choice, MA Condos in High Demand. 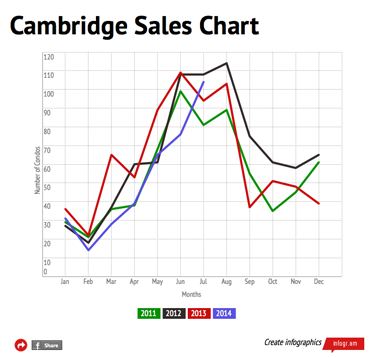 In Cambridge, inventory was up in July by 55%. Properties going under agreement lagged slightly compared to last year down -1% with month to date sales down 6% and year to date sales, down considerably at -30%, compared to the same time last year. The average sales price was 17% or $121,777 dollars higher than last year up from $555,836 to $652,762. The average sold square foot price 578 per foot. The average unit size 1,215 square feet. 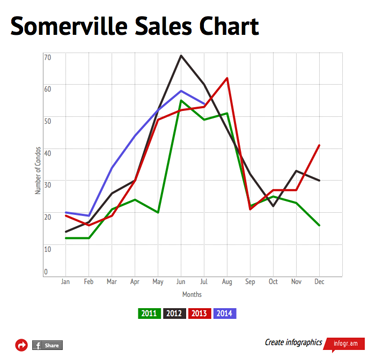 In Somerville, the inventory shrunk by -15% compared to July of last year. Properties going under agreement for the month were down as well by 13%. Sales month to date are off by -18% with year to date sales still showing a positive gain of 7%. The median sales price rose $70,000 from $510,000 to $580,000. The average sold square foot price $503,611. The average unit size was 1,183 square feet.